As we've discussed previously (but never to this level of detail), the medical community's arsenal of anti-pathogens is somewhat limited--90% is comprised of antibiotics, with another 5% of antivirals, and 5% cytokine therapies. (In truth, there are actually very few effective medical antivirals.) The discovery and use of these drugs has represented one of the greatest achievements of medical science over the last hundred years. Unfortunately, thanks to arrogance and misuse, resistant strains of bacteria and viruses have proliferated like fear mongers in an Ebola epidemic. And in truth, this trend may be almost impossible to stop since it is the result of the simple rules of evolution. Any population of organisms, bacteria included, naturally includes a handful of variants with unusual traits -- in this case, the ability to withstand a particular antibiotic's attack. When this antibiotic is used and kills the overwhelming majority of defenseless bacteria, it leaves behind those few bacteria that can resist it. These renegade variants, now the only bacteria left, are now free to multiply without constraint, increasing their numbers a million fold in a single day, instantly becoming the new dominant variant. In other words, the very act of using an antibiotic creates the opportunity for resistant strains to flourish and become dominant. That means that the next time you use the antibiotic, it will have little effect. It's important to understand that antibiotics vary in the way they kill microbes. Penicillin, for example, kills bacteria by attaching to their cell walls and then breeching those walls, thus killing the bacteria. Erythromycin, tetracycline, and streptomycin, on the other hand, kill bacteria by attacking the structures inside the bacteria (ribosomes) that allow them to make proteins, thus also destroying the bacteria. Because each antibiotic is a single compound and one-dimensional in its approach, it's not that hard for microbes to "evolve" around such attacks. For example, microbes resistant to penicillin have developed cell walls that prevent the penicillin from binding. Similarly, other variants prevent antibiotics from binding to ribosomes, thus neutralizing the effect of those antibiotics. Using antibiotics with different attack modes in combination can help in the short term, but it also accelerates the breeding of superbugs, resistant to many types of drugs. Where it gets really frightening, though, is that bacteria swap genes like Facebook members swap friends -- which brings us to vancomycin, until a few years ago, the antibiotic of last resort. When all other antibiotics failed, doctors knew they could count on vancomycin. But then vancomycin resistance was discovered in a common hospital microbe, enterococcus. By 1991, thirty-eight hospitals in the United States reported the variant. Just one year later, vancomycin-resistant staph bacteria were observed with the same gene. What this means is that not only are bacteria programmed to "evolve" defenses against antibiotics, but once they produce such a defense, they are also programmed to rapidly share that defense with other strains of bacteria, thus rapidly spreading the resistance through the entire bacterial world. That is truly scary! Viruses evolve around antivirals in much the same way as bacteria evolve around antibiotics, but even more quickly since their DNA is much simpler -- more primitive, more malleable as it were. On the other hand, how medicine deals with viruses is actually quite different. A virus is defined as an infectious "agent" that typically consists of a nucleic acid molecule in a protein coat, is too small to be seen by an optical microscope, and is able to multiply only within the living cells of a host. They can infect all types of life forms, from animals and plants to bacteria and archaea (single-celled microorganisms that are similar in size and shape to bacteria but possess different genes and incorporate different metabolic pathways). There is a major debate within the scientific community as to whether or not viruses are actually alive, with the community currently punting the issue by declaring that they exist in a "gray area. "1 But in truth, the debate is more intellectual than practical because, whether they are alive or not, viruses behave as if they are living and have intent--and that intent is often harmful to us. One of the primary medical tools for dealing with viruses is pharmaceutical antivirals. The major difference between antivirals and antibiotics is that unlike most antibiotics, antiviral drugs do not destroy their target; instead they merely inhibit their development. Nature too has an abundance of antivirals such as tea tree and eucalyptus oils,2 and in fact, most medical antivirals are derived from nature. Tamiflu, for example, was developed from a biochemical found in the Chinese star anise. (We'll talk more about Tamiflu in a bit.) However, alternative medicine gives us access to a second option that is unavailable to us in the world of pharmaceuticals: virucides. Natural virucides don't just "inhibit" viruses; they can actually destroy or deactivate them. That's a huge advantage when fighting a viral infection. Viruses work by invading cells, making copies of themselves inside the cell, and in many cases, destroying the invaded cell in the process before they burst forth to then invade millions of additional cells--and on and on. Viruses can disrupt the functions of the invaded cell. They can also interact with the chromosomes in the invaded cell, which is how they can cause cancer. And some viruses--think HIV--specifically attack and invade the cells of the immune system, causing widespread loss of immune system function throughout the body. Like the viruses themselves, antiviral drugs can also work in a number of ways. They can alter the structure of the invaded cell, or even its genetic material, so that the viruses can no longer use it to multiply. Other antivirals work by blocking enzyme activity in the invaded cells, thus inhibiting the ability of the virus to multiply. And yet other antivirals make use of interferon substances that were produced by virus-infected cells trying to defend themselves to protect other cells from being invaded. If all that pharmaceutical antibiotics and antivirals did was negate themselves and breed superbugs over time, that would be bad enough. Unfortunately, their effect is far more damaging. Since many pharmaceutical drugs are drawn from nature, they also undermine nature. Let me give you an example. And for all the reasons that we just discussed above, flu viruses are easily able to mutate around the single magic bullet ingredient in Tamiflu. So how does that undermine nature? To put it simply, Roche has managed to take a natural cold and flu remedy that viruses had not been able to evolve around since the dawn of man, and by reducing it to a single active component, breed multiple strains of resistant flu viruses in short order. Astoundingly, they have managed to negate one of nature's best antivirals in less than a decade -- truly an amazing achievement. When you think about how quickly pathogens evolve around pharmaceutical antibiotics (and even faster around antivirals), it's more than amazing that these same microbes have been unable to do so against most natural anti-pathogens. Garlic, olive leaf, and oil of oregano, for example, are still effective even given thousands of years for those pathogens to evolve around them (not counting those natural anti-pathogens such as star anise that have been nullified through the "unnatural" intervention of the pharmaceutical industry). How can that be? Actually, it's quite simple -- or more accurately, simply complex. While drugs, as we have discussed, are essentially one-dimensional in their mode of attack, which allows microbes an easier path to evolve around them, natural anti-pathogens often contain dozens of biochemicals. To be sure, not all of them are necessarily "active" when tested in isolation, but many of the so-called inactive components potentiate the active ones and offer therapeutic combinations numbering in the thousands, even within a single plant. This presents a complexity that makes it virtually impossible for microbes to work around. When you combine several natural substances/herbs--each with their own complement of bioactive compounds--in one formula, the combinations of compounds are beyond counting. Quite simply, microbes cannot evolve around them--unless assisted by the greed and incompetence of pharmaceutical companies. The widespread use (and misuse) of pharmaceutical antibiotics and antivirals has led us to a world filled with growing numbers of drug-resistant "superbugs." Eventually, one of them will unleash a devastating worldwide plague that, by definition, will be resistant to all that medical science can throw at it. At that moment, natural anti-pathogens may offer the only viable defense. When taken at face value, the end of antibiotics (and antivirals too) is a frightening prospect--even for those into alternative health. Although people who are health conscious try and avoid antibiotics and antivirals as much as possible, there are times you truly need them. And when you need them, you really, really need them to work. If they don't, the potential for death rates from infection climbing through the roof is a very real possibility. Antibiotic resistant infections, using the most conservative estimates possible, now kill about 23,000 people each and every year in the United States alone.4 But some less conservative estimates say the number is closer to 100,000, which would already make drug resistant bacteria and viruses the sixth leading cause of death in the U.S.5 Then, once you eliminate the effectiveness of the remaining antibiotics and antivirals we still have in our arsenal over the next several years, you can easily see drug resistant infections occupying the number three spot, or even higher. How fast that day actually arrives is up to us. We've crossed the point of no return for existing drugs. Can't go back, and we will have to deal with the consequences moving forward. Can't change the obsolescence of those drugs no matter what we do. However, what we do in the near term does influence how soon we will have to face that day of reckoning and what happens after that--and that matters big time. Given enough time and money, drug manufacturers can probably find one or two new antibiotics to help buy us some more time. But the big ace in the hole--and don't fall out of your seats--is genetic engineering. Despite what you might think about genetically modified foods, and not to mention the fact that genetically engineered plants and animals may have actually played a major role in directly promoting antibiotic resistance in the first place,6 genetic engineering is actually the future when it comes to fighting bacteria and viruses. (By the way, genetic engineering is already involved in manufacturing most of the vitamin B2, B12, E, and C that you find in health store supplements.) What genetic engineering is likely to produce in the post-antibiotic era promises to be far, far more effective than today's antibiotics, and far more targeted. Today's antibiotics are essentially a blunt weapon. Yes, they kill the bad guys, but they also kill the good bacteria in your body--bacteria that are essential for your health. The post-antibiotic age has the potential to be far healthier. The future lies in using a particular bacterium's genetic code against it by locating its unique vulnerabilities and then modifying other bacteria to produce agents that target those particular vulnerabilities--and nothing else. This would mean that we could fight both bacterial and viral infections far more effectively and with virtually no side effects. It would also give us the ability to counter any workarounds the pathogens develop as fast as they develop them. One of the most interesting strategies involves directing specific counterattacks at the infectious agents' resistance weapons--as revealed through genetic decoding. Treatments could then be devised that combine an antibiotic that might currently be ineffective with a second drug that has little antibiotic effect but possesses the power to disarm a bacterial or viral defense molecule. Other hybrid treatments could be devised using compounds that impair the invading pathogen's ability to pump the antibiotic component out of the bacterial cell. This is coming. The only question is time. Do we get to roll relatively seamlessly from antibiotics of diminishing effectiveness into targeted, genetically engineered, infection-fighting drugs, or do we have an extended gap in which deadly bacteria and viruses have free reign and kill millions of people before we plug that gap? Getting new antibiotics and antivirals into the pipeline is not going to be easy. Pharmaceutical companies have little incentive to develop such drugs because they're not very profitable. Most people only need antibiotics and antivirals for just a few times in their lives--and then only for a few weeks until they get better. Compare that to a new statin drug that requires people to stay on them every day for the rest of their lives. For this reason, there has been a 75% decline in the development of new antibiotics since 1983. And the development process is lengthy. If a pharmaceutical company decided today to develop a new antibiotic or antiviral, it would be ten years and hundreds of millions of dollars before that drug would be available to patients. And then, thanks to the ability of pathogens to quickly evolve around them, they only remain effective for a couple years, months, or weeks, as the case might be. Unless governments decide to subsidize their development, we're unlikely to see many stop gap antibiotics and antivirals. In other words, we're pretty much stuck with what we have unless governments totally transform their mindsets--which is another way of saying we're stuck with what we have. The time we have left for using the drugs now in place is likely to get exponentially shorter. If physicians stopped prescribing unnecessary antibiotics, if patients actually finished their course of antibiotics instead of stopping the moment they felt better, and most important of all, if large commercial farms abandoned all use of antibiotics in the raising of their beef, pork, poultry, and farmed fish, then the whole process would slow down, and we would have more time before new methods for fighting infection would need to be in place. But nothing in modern human history says that even one of those things is likely to happen--at least in time to make any difference. Keep your immune system optimized so that you don't get sick in the first place. Keep a supply of natural pathogen destroyers on hand to give yourself a fighting chance against any infection you might get. And be sure and start using the anti-pathogen formula all out the moment there is any indication that you have come down with something. Remember, it is far easier to defeat an infection during its incubation phase then after it has taken hold. And no matter what advances science brings, there will always be a role for natural antipathogens, which tend to be broad spectrum and capable of working against all pathogens--known and unknown-- as opposed to targeted pharmaceutical drugs which would have to be retargeted every time a new pathogen appears. Nor are they quite as dangerous. One other thing to understand about vaccines is the concept of "herd immunity." The concept is simple. When a high enough percentage of a community is immunized against a contagious disease, then everyone in that community is protected against the disease because there is little opportunity for an outbreak to take hold. Even those who are not immunized are largely protected because the overall immunization of the community means that the spread of contagious disease is contained. In other words, people within the community are free to opt out of vaccination and still not come down with the disease--at least until, the critical level of non-immunization is breached and the disease is free to spread. The principle of community/herd immunity has been used to control a variety of contagious diseases, including influenza, measles, mumps, rotavirus, and pneumococcal disease. So, does vaccination work? To some degree, yes, but the effectiveness varies from vaccine to vaccine--and it always comes at a cost. Most people probably believe it's worth it. But if you or one of yours happens to have a severe reaction to the vaccination and have to pay "the price," then probably not so much. For more about the pros and cons of vaccines, check out: http://jonbarron.org/article/anatomy-and-physiology-immune-system-part-3. Pathogen destroyers represent an alternative, complementary route to assisting your immune system. They don't build immune function as the immune boosters that we discussed in our last newsletter do. Instead, they "free up" immune function by directly destroying pathogens in the body that would otherwise occupy the attention of your immune system. They function as natural antibiotics, antivirals, and virucides. Before we talk about specific anti-pathogens, we need to talk about the optimum time to use them: the incubation phase. This is the period of time between exposure to a pathogenic organism and when the classic full-blown symptoms and signs of the disease first become apparent. For the flu, this period can run from one to three days. For the common cold, two to five days. For Ebola, two to 21 days. And for mononucleosis, it can take as long as 42 days. Everyone knows the symptoms for the common diseases. When you have a full blown cold or flu, you know it. That's when most people take action. Unfortunately, that's too late. At that point, all you can hope to do by using anti-pathogens is to shorten the duration of your illness a few days. After all, your immune system is already on the job. I'm really tired; I need to catch some extra sleep. I shouldn't have eaten that extra ice cream; I can feel it in my throat. My allergies are kicking in; my nose is starting to plug up. I think a strained myself cleaning the house today; my body aches. The kids drove me crazy; I have a dull headache. But it's important not to ignore these early symptoms. Stopping the flu, for example, in the incubation phase is much, much, much easier than getting rid of it once it has established itself. If you hit it hard during incubation, you can be almost 100% effective in stopping it cold (all puns intended). If you allow it to incubate and fully manifest, it will take you several days to beat it back. It's true that you can significantly cut the time of your sickness, but you will still be sick for several days, and you will need to keep taking the anti-pathogenic formulas for four to five days after you feel better to make sure you clear the virus from your body and it doesn't reassert itself. Definitely, it's better to shut it down during incubation. And what's the worst that happens if you read it wrong and you're not actually infected -- you end up having some garlic and olive leaf extract a couple of times because the kids really did drive you crazy. Is that too high a price to pay for almost never getting sick? One other thing to keep in mind is that sometimes you're in situations where you don't even have to wait for any symptoms to appear to take prophylactic measures. 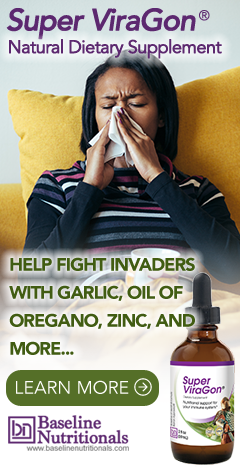 For example, whenever I take a trip that involves traveling on an airplane, or that puts me in contact with large numbers of people during cold and flu season, I automatically use anti-pathogens before bed and upon rising every day of the trip -- one capsule each of olive leaf extract, oil of oregano, and one capsule of AHCC to keep my immune system primed. Then as soon as I get home, I'll down an entire bottle of my own garlic based liquid formula just to make sure. (I tend not to bring the garlic formula on trips in case it breaks in the suitcase.) I have not gotten sick once while traveling when following this routine. We talked about cytokine storms in the last newsletter, but let's revisit them for a moment since they are directly connected to the importance of pathogen destroyers. In a cytokine storm, the immune system sees a virus that it has never seen before, and it goes nuts, whipping itself into a frenzy in response to the invading virus. A biochemical cascade of immune cells and immune system bio-chemicals such as interferon, interleukin, and monokines -- collectively known as cytokines -- literally pours into the lungs. The subsequent damage to the lung tissue caused by these cells and bio-chemicals leads to a condition called acute respiratory distress syndrome (ARDS) that literally chews up a person's lung tissue, which causes fluid to pour into the lungs, ultimately causing the victim to suffocate as a result of their own disease-fighting chemistry. Most common flu's and colds do not produce cytokine storms. Most flu's kill people who have weak immune systems by eventually opening the door for pneumonia, which is what actually kills them. That's why health authorities specify that the very old and very young and those with weak immune systems are prime candidates for annual flu vaccines (even though they don't work very well--especially in the very old and very young). And for that matter, Ebola does not produce cytokine storms. Ebola kills by breaking down the clotting factor in your blood so that you bleed to death internally. But swine flu, avian flu, and most notably, the great flu pandemic of 1918 are different animals. They don't kill through pneumonia. They don't cause internal bleeding. They kill you by unleashing a cytokine storm, which means that it is your own immune system that kills you. And this means that the most vulnerable are not the very old and the very young but healthy adults and pregnant women, people who have very strong immune systems. In other words, the stronger your immune system, the greater the danger -- the exact opposite of standard flu strains. Does that mean that you should weaken your immune system to protect against the flu? Not at all! That would be silly. Strong immune systems are good for many, many reasons. However, it does mean that you want natural anti-pathogens on hand in your medicine cabinet to use at the first sign of a cold or flu. It will protect you against standard flu, and if you perchance catch a rogue strain of avian or swine flu, the anti-pathogens will kill enough of the virus to take your viral load down to the point that your immune system can do its job with no risk of being forced into a cytokine storm. You get the best of all possible worlds. Anti-pathogens both kill and inhibit viruses and bacteria. If used during the incubation phase, yes, they have the potential to totally eliminate most invading microbes. If used after the pathogen takes hold, that result is unlikely. Once an invader has established itself, the goal in using an anti-pathogen changes. You're now looking for the anti-pathogen to inhibit and kill enough of the invaders to allow your immune system to do its job more easily. For example, when it comes to Ebola, everyone focuses on the 70% mortality rate. I, on the other hand, prefer to focus on the 30% survivor rate. What that tells me is that the immune systems of 30% of the people who are now getting Ebola, with no medical help other than rehydration, are not succumbing to the virus, but rather, are defeating it. With a virus like Ebola, the key is time. Do you survive long enough for your immune system to win out, or do you die before that happens? Now imagine how much higher the number of survivors would be if you could take the viral load down by 20% to 30%, or more and gain the extra time your immune system needs to win out. One thing to keep in mind is that you probably want to keep a supply of natural anti-pathogens in your medicine cabinet because there is likely to be a run on them at the first hint of a viral pandemic. We saw just such a run on Tamiflu during the avian and swine flu scares -- even though it provided little protection. And we saw a similar run on iodine tablets after the meltdown at the Fukushima Daiichi nuclear plant in Japan. And it's not like your supply of natural anti-pathogen will go to waste, as you will use it regularly for preventing and shortening the duration of everyday colds and flus too. Now let's take a look at some of the natural anti-pathogens at your disposal. We'll start by looking at those that I use in my own anti-pathogen formula. Note: everything that's been said about garlic goes for onions too. Onions and garlic share many of the same powerful sulfur-bearing compounds that work so effectively as antiviral and antibacterial agents. Habanero (Capsicum chinense Jacquin) and horseradish (Armoracia rusticana) are stimulants that quicken and excite the body. They energize the body, stimulating its defenses against invading viruses, and help to carry blood to all parts of the body. They are also diaphoretics and thus help raise the temperature of the body, which increases the activity of the body's immune system. They are both often used in herbal formulas to complement and potentiate the activity of other ingredients. In fact, studies have shown they can even potentiate the activity of pharmaceutical antibiotics,33 which effectively validates their use in herbal formulas for the same purpose. There are a number of essential oils--such as clove, cinnamon, and thyme--that have proven anti-pathogenic properties. They were not included as part of the formula for one of two reasons. Their bioactives are essentially the same as one of the herbs already used in the formula. For example, the primary active biochemical in clove oil and thyme oil are carvacrol and thymol, but they are present at even higher levels in oil of wild mountain oregano. The oil may have anti-pathogenic properties, but they are not that strong. Colloidal silver is a suspension of submicroscopic metallic silver particles in a colloidal base. Although colloidal silver can be an effective anti-pathogen, I have several concerns. Concentrations can vary wildly in supplemental forms, and in many products, the silver particles are too big and not a true colloidal suspension, meaning that, over time, they drop out of suspension and the concentration in the liquid lessens. When it is at sufficient strength to be effective, colloidal silver is indiscriminate -- that is, it kills the good intestinal bacteria as well the bad. And it can, if taken in sufficient quantity, cause argyria, a "potentially" irreversible blue/gray discoloration of the skin. Although rare as the result of using colloidal silver, it has nevertheless been documented. Then again, although all out argyria is rare, milder versions where the skin merely picks up a very slight gray cast that is so mild that it is essentially unnoticeable, but nevertheless makes you look perpetually tired and worn, are far more common--but undocumented. It should be noted that new versions of silver products, such as Silver Sol, claim to have eliminated the potential for argyria, but that claim has not been tested over time. So, in the end, my bottom line recommendation (and I know this will anger many colloidal silver advocates) is to restrict colloidal silver to external use except for special occasions. Using it for a few days if you come down with the flu or a bacterial infection is not going to be a problem. Drinking a glass every day as a prophylactic measure is probably less advisable. And be sure to follow any internal use with a good probiotic supplement. Again, silver is a full spectrum antibiotics. It tends to kill all bacteria -- both good and bad. As I said in the last issue of the newsletter, I like colloidal silver as an antibacterial agent especially for topical use, and studies support its effectiveness in this regard. However, studies do not consistently support its effectiveness against viruses.55 If you come down with Ebola, it certainly wouldn't hurt to take colloidal silver; it just may not perform as promised. That said, for anything other than very occasional use, I prefer ionic zinc, which has similar efficacy without the risk of skin discoloration issues. Note: while writing this, and I kid you not, Kristen and I went out for Sunday brunch--and who should we see sitting 20 feet from us but a woman with pronounced argyria! Her skin tone matched the picture above--maybe a half tone less intense, but still strongly blue-gray. What are the odds? Or perhaps, with some voices in alternative health recommending heavy dosing with colloidal silver, it's no longer quite as rare as it once was. Anti-pathogens should not be used on a daily basis. To do so puts both your microbiome and beneficial viruses at risk. We have discussed the microbiome before. Within the human body (both inside and on the surface of your skin), it is estimated that there are 10 times as many microbial cells as human cells, and the vast majority of them are actually beneficial and "support" our biological functions. These symbiotic microbial partners perform a number of metabolic reactions that are not encoded in (and therefore not handled by) the human genome but are nevertheless necessary for human health. And it's not just bacteria. A number of viruses actually play a beneficial role in your health. Some viruses, for example, can help build immunity to related but more dangerous viruses. For example, exposure to cowpox, a fairly mild, non-contagious virus, made people immune to smallpox, which was highly contagious and a very deadly. The smallpox vaccination was developed from cowpox. Viruses can also play a role in evolution by transferring genomes through a mechanism called horizontal gene transfer, by which an organism can incorporate genetic material from another organism to which it is not directly related. Horizontal gene transfer can be thought of as natural genetic engineering--that happens either by chance, or by the hand of God.56 The bottom line, though, when it comes to viruses is that we're just beginning to understand them. Keep in mind that until just a few years ago, the medical community had no understanding of the importance of the 100 trillion bacteria in our microbiome. They saw no problem in drinking chlorinated water, using antibiotics indiscriminately, and washing with antibiotic soap. Now they know differently. Perhaps in the next couple of decades we will learn more about the as yet undiscovered benefits of some viral infections--or not. The bottom line is that constantly supplementing with anti-pathogens or using them whenever you bathe or wash your hands puts all those benefits--and your health--at risk. Anti-pathogens should only be used on an "as needed' basis. But you will want to keep a supply on hand in your medicine cabinet so that you can use them when needed--particularly in the incubation phase of an illness. I had your information from a long time ago and I'm glad to see this writing again.… When I'd like to know is have you found any thing that combats morgellons? look forward to seeing what you might've come up with..
No one knows what causes Morgellons. Medically, it is “an unexplained skin disease.” Some say it is a physical illness; others call it a form of psychosis. Looking for magic bullet solutions for unexplained conditions is a tough way to go. But is exactly for such conditions that Jon created the Baseline of Health Program. This program is designed to clean out and holistically rebuild every system throughout the entire body, so that your body can do what it was designed to do…heal itself. You might want to pick up a copy of Lessons from the Miracle Doctors, which details how to work through the program step by step, and check it out for yourself. I make my own colloidal silver, and it's 10 ppm micro-particles. My whole family and I take a half-ounce daily, and we haven't come down with any kind of sickness for over 8 years now, ever since I bought the machine and started making this colloidal silver. As you know, the cells of the body have receptors for silver, and with these micro-particles, the small amount we take goes to the cells and never gets to the gut to cause any kind of problems. The "medical profession" keeps bringing up the moron who drank a quart of 400 ppm silver a day, with the particles too big to get into the cells in the first place, and he turned gray, so the average person with no knowledge is afraid of taking any colloidal silver. Pretty sad. Hi Tom: Jon dealt with most of these issues above. As for what causes argyria, you will find a different theory on every website that promotes it. The bottom line is that no one really knows why some people change color and others don’t. However, as Jon suggested, there may be many people who are displaying the initial signs of skin graying, but not so much as to be readily apparent, and a long way from the bright blue-gray that we commonly associate with argyria. And as for its efficacy, unfortunately, the studies are not quite as definitive as your personal experience. In any case, the evidence suggests it is more effective against bacteria than viruses. But if it’s working for you, by all means, go for it. As Jon says above, garlic is his favorite natural anti-pathogen for “the simple reason that it is the "kindest" to the beneficial bacteria in the intestinal tract. Eating several cloves of garlic a day is not going to be a problem for your intestinal bacteria. When Jon says you don’t want to use a strong natural anti-viral formula every day, he’s specifically talking about a “formula” that is many times stronger than garlic by itself. And in particular he’s talking about the formula that he created that contains all of the natural anti-pathogens listed above, Super ViraGon. I have been using OLE for three months, but the results are awesome! My nostrils used to get blocked in intervals and this had gone on for the last fifteen years! Also,I could easily get sick with typhoid. Now, this is no more! OLE is just miraculous!! Tamiflu was created at Gilead, then sold to Roche. Gilead the infamous patent owner of a novel HepatitisC drug.that it sells from 700 to 500.000 according to the money the patient can offer. Is this free-market or extorsion, is this capitalism or terrorism? Again I respectfully ask why there is no discussion of the effective role of oxygen in the treatment of bacteria and virus infections. Photoluminescence therapy appears to be extremely effective and free of side effects. Informational site - www.uvbipower.weebly.com . Excellent article. Unravels the 'mysteries of viruses, bacterium and microbes and how to safely and effectively combat them. Wonderful, well explained article! Thanks you for all you do. we use good old cure in europe and isreal----elderberry syrup,works great and fast..thank God.. Frequently mentioned in articles is the notion (fact?) that 80% of the immune system resides in the 'gut'. Today there is a variety of beta glucan products such as Beta 1,3D Glucan that are advertised as raising immune cell levels in an as required way by 80% or more in 24 hours. Would this be an ideal way to keep the immune system primed so to speak by daily supplementation? I ask because this is a recommende treatment for cancer sufferers, in the alternative community at least. Beneficial bacteria in your gut are a first line of defense against invading pathogens. In a healthy intestinal tract, they both line every inch of your intestinal tract, which prevents pathogens from gaining a foothold, and they actively kill invading pathogens in your gut to prevent them from taking their place. By preventing pathogens from ever getting established in your gut, this removes a massive burden on your immune system allowing it to focus on the handful of pathogens that do make it into your bloodstream. Beneficial bacteria produce nutrients and biochemicals that directly improve immune function such as lactoferrin and transfer factor. Bottom line: your immune system doesn’t reside in your gut, but the beneficial bacteria that do reside in your gut can impact the efficacy of your immune system by upwards of 80%. Very many thanks for this illuminating reply and indeed for the whole article - for me completely riveting. Have you been keeping up with the vaccine dark side and the wipe out of about 12 alternative doctors between June and the end of 2015? Interesting that 3 of those doctors were collaborating on a researcn project that found both autistic and cancer patients had a foreign substance in their blood called nagalese, which prevented one part of the immune system from sending a message to another part of the immune system. the treatment was to give the patients immune systems the messenger GcMAF - then the patients immune systems were able to activate production of macrophages. They were curing various kinds of cancer and had an 85% cure rate of autism, with the other 15% showing improvement. They theorized the nagalese got into the patients via vaccines. Then our FDA protective thugs raided all 3 of their clinics, confiscating all their records, all their supplies. Dr. Bradstreet was one of those doctors and his body was found floating in the river 3 days after the raid, a gunshot wound in the chest, and declared a suicide with no investigation. Thee other two doctors also were raided and also died mysteriously. There was only one lab on the planet testing the blood for nagalase and also only one supplier of GcMaf! Not sure but both were in the same area - think it was Switzerland or Norway! A good site to look it up is naturalnews. Their equivalent of our FDA raided both the same time the FDA raided the 3 doctors here. One of the doctors interviewed by Ty Bollinger in his Global Quest for Cures also talked about the nagalase in the blood of cancer patients, but were treating them with probiotics, mentioning one they used called "BRAVO", saying they knew it worked because the nagalase levels dropped after using them. Do recall seeing something about you could order the strain of probiotics and make your own Yogurt - looked it up at the time and found you had to order them from another country and the price was $400 at the time. "all vaccines are harmful and Lost Tolerance 1, 2 and 3". message out - don't let him die in vain. The preponderance of research I've reviewed suggests that ebola does in fact cause a cytokine storm. Could you share your references that support the opposite conclusion? As an educator I want to make sure that my information is correct, before sharing. Thank you. Ebola is a hemorrhagic disease. The virus breaks down the clotting factor in your blood so that your blood becomes thin like water. This causes internal bleeding that ultimately leads to catastrophic loss of blood pressure and total organ failure. While it is true that a cytokine storm may play a role in the final stages with Ebola, a healthy immune system works to your advantage in all of the early stages. In other words, with Ebola, if your immune system is weak and the virus proliferates exponentially, then yes, as a final step in dying, a cytokine storm is unleased in a last gasp effort by your body to fight the disease. But you were pretty much already dying at that point. On the other hand, if your immune system is strong, it holds the virus in check so that it never reaches the last stage. The simple evidence of the difference is that in true cytokine storm viruses like the 1919 flu epidemic, avian flu, and swine flu it was the young and healthy who died, not the old and feeble. Ebola, on the other hand, mostly kills the weak and those with compromised immune systems. Thank you. I appreciate the clarification. I've been working on a research-based supplemental protocol for ebola, and there are certain herbs, such as elderberry, that I've been hesitant to include, due to their potential to exacerbate the cytokine storm. However, my current perspective is that they are likely safe and appropriate for use in the initial stages of the disease, but not at the advanced stage. Thanks again for your response. Are you aware of any 'conflicts' that may occur by taking anti-pathogens and antibiotics at the same time? A lot of people (unfortunately) like to take their antibiotics as well 'just to be safe', at least until their confidence in natural health grows. Also unfortunately, the success of their treatment is then likely to be attributed to the antibiotics more than the antipathogens, but that's all a separate issue for the current question. There are no known conflicts with antibiotics. But, as always, if you are taking any medication, check with your doctor first. I research a lot. Every bit I read on the immune system says 80% of our immune system is in our digestive system but your say no. So where is it ??? Also now I have to stop talking all my daily supplements like garlic, silver (All silver companies say it kills bacteria, virus and Pathogens) , ginger root etc. because It they will kill our good gut flora also. I'm sorry and very confused. Who is right About the gut flora and also I guess I should stop taking any Anti-pathogen supplements every day because they are more powerfull than just eating a glove of garlic (Yuk) or a bite of ginger root (yuk)???? So whats the answer here please?? Jon doesn’t say “no” at all. Probiotics are fundamental to properly functioning immune system—as are a number of other factors as well. Check out the following two articles.